Mark Weisenmiller is a Florida-based author/historian/reporter. Previous employers include United Press International (UPI); Deutsche Presse Agentur (DPA); Inter Press Service (IPS); The Economist, and the Xinhua News Agency (XNA). He is currently at work on a non-fiction book of reportage about China, which will be the second in a planned series of non-fiction books of reportage about the countries and regions of the world. Over 40 years have passed since the Supreme Court of the United States decided the case of Clay, aka Ali, v. United States, which was argued before the Supreme Court Justices on April 19, 1971. 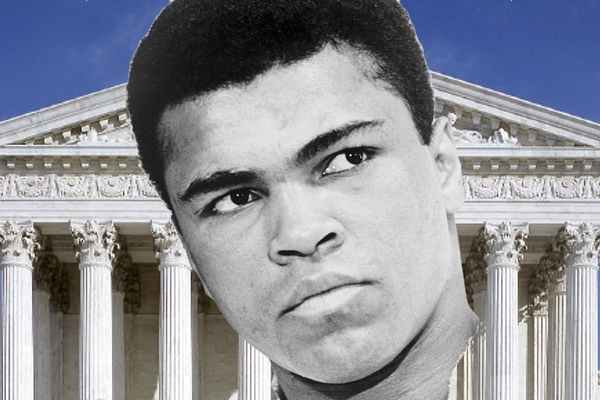 On June 28th of the same year, the High Court ruled in favor of the petitioner Muhammad Ali (born Cassius Marcellus Clay Jr.), the boxing heavyweight champion of the world, who was stripped of his title by various boxing commissions when he refused to be inducted into the U.S. Army. Ali claimed exemption due to the fact that he was a Nation of Islam (also known as the Black Muslims) minister. The fact that he did so when the U.S. was involved in a war -- Vietnam -- angered many people. The idea that sports stars in the U.S. were infallible athletic gods walking among us mere mortals was always disputed by some and with good reason. Ty Cobb, according to many accounts, was a virulent racist and Babe Ruth spent most of his adult life in an alcoholic stupor. For decades, beer companies supplied free samples of their beverage to National Hockey League (NHL) players and beer is not the ideal beverage if one is a professional athlete. Before the days of million dollar contracts, the beer companies employed these same athletes as salesmen during their off-season free time. The Molson Brewing Company once owned the Montreal Canadiens. Since World War Two, the National Football League (NFL) team owners have had to deal with the fact that gambling on NFL games happens and in the long history of the league, occasionally NFL players have been found guilty of betting on their own team. Regarding gambling, Major League Baseball (MLB)’s all-time hit accumulator, Pete Rose, received a life-time ban on participating in the sport when he admitted to betting on baseball games. For much of American boxing history, the sport was controlled by mobsters, who made sure that the outcome of bouts was fixed beforehand. Yet what Muhammad Ali stood for somehow superseded all of the above. He was a 6’4,” 235 pound bombastic personality named after the 19th century abolitionist and anti-slavery newspaper editor, Cassius Clay. His father, Cassius Marcellus Clay Sr., was a talented artist and sign painter who was proud of his black lineage. Odessa Clay, Ali’s mother, was born of mixed blood and was part Irish -- and so, of course, is her famous son. Born a Christian, Clay converted to the Black Muslim faith 24 hours after he won the heavyweight championship of the world in 1964. At first he told reporters that he wanted to be known as Cassius X, but then amended that to the name of Muhammad Ali. He began boxing at the age of 12, won the 1960 Olympic Light Heavyweight gold medal, and did not retire from the sport until he was badly beaten by Trevor Berbick in a December, 1981 match held in the Bahamas. Until Parkinson’s Syndrome had begun to stop his speech (he actually began to shown early signs of the disease at the time of the Berbick fight), Ali was always talkative and displayed a colorful and outgoing personality. So during the 1960’s, here came a brash, young (he was only 22 when he won the heavyweight title), prolix man on the world stage. The fact that he publicly renounced Christianity, and took up the Nation of Islam religion (in 1975, he would convert to Sunni Islam) at a time when the American power structure (legislative; judicial; presidential; media and press; corporate; military) was run either by Christians or Jews baffled Americans. At the press conference where Ali made his announcement that he was a member of the Nation of Islam, he famously said, “I don’t have to be what you want me to be. I’m free to be what I want.” Influential newspaper sports columnists Jimmy Cannon and Red Smith belittled Ali in their columns. The day after Ali returned from a trip to New York with his then good friend Malcolm X (Ali would later stop following Malcom X’s beliefs and devote himself to Black Muslim founder Elijah Muhammad’s tenets) at a Muslin rally, he “received a notice to report to the Armed Forces Induction center in Coral Gables, Florida to take a military qualifying examination,” wrote Howard L. Bingham and Max Wallace in their book, published in 2000, entitled Muhammad Ali’s Greatest Fight: Clay v. The United States of America. Bingham was Ali’s long-time personal confidante and personal photographer. Later, on March 20, 1964, Ali’s military aptitude test results were made public. He failed the test, and especially had trouble with the mathematical questions on the test. For once, the talkative Ali (who had barely graduated from the public high school that he attended in his native Louisville, Kentucky) was quiet; frankly, he was embarrassed by the disclosure that he flunked the test. “I said that I was The Greatest [a title he bestowed on himself previously], not The Smartest. When I looked at a lot of them questions, I just didn’t know the answers. I didn’t even know how to start about finding the answers,” confessed Ali. All of this took place during the time of the civil rights movement for blacks and also the American military build-up in Vietnam. Both of these events created emotional turmoil for Americans, so Ali’s growing discovery of his true self (i.e., his religious conversion, and his inchoate reflections about the world), which he was always glad to share with reporters and audiences, made for yet another spicy ingredient in the American societal stew. Federal Bureau of Investigation (FBI) Director J. Edgar Hoover, U.S. Senators, and others in the 1960’s federal government power structure refused to believe that Ali failed his military aptitude test. When the FBI began an investigation they found that Ali was at best a sub-par high school student. For some months Ali himself believed that all of this meant that he was stupid, but his former high school teachers, reporters, and others who knew him well have noted that he was a highly intelligent person. The military aptitude test was as flawed as the standard IQ test. Author Norman Mailer (who attended Harvard, and was certainly no mental midget) knew Ali well and told of Ali being wise and intelligent on a number of subjects. After Ali’s retirement from boxing, he acted as a Goodwill Ambassador. He knew numerous world leaders well, ranging from Cuba’s Fidel Castor to South Africa’s Nelson Mandela. He personally designed many of the buildings at his personal; boxing training camp. Citizens, irate that Ali was preparing himself not to be drafted, wrote letters to President Lyndon B. Johnson asking him to do something about the situation. A lesson that professional athletes learned from Ali is that, thanks to a progression in communications, they can voice their comments and ideas on any topic in the world and they will be known throughout the world. Furthermore, the more famous and talented the athlete, the more people will somehow react when he or she voices said comments and ideas. Thanks to a boom in satellite technology, and also other media and press technology, which began in the 1960’s, Muhammad Ali became the world’s first truly international sports star. People from Atlanta to Zanzibar could see Ali daily in television news reports and also watch his boxing matches. Ali became a hero to other famous black American athletes of the 1960’s (most notably football’s Jim Brown and basketball’s Lew Alcindor, who would become known as Abdul-Jabbar). They saw that -- contrary to notable American black athletes of the past -- they were free to offer their opinions on anything they wanted. Both Brown and Abdul-Jabbar also took note that Ali spent much of his free time doing charity work and also kept busy with other altruistic activities and so Brown and Abdul-Jabbar began to do so as well. In April of 1964 Ali went on a tour of numerous countries in Africa. The tour was scheduled previous to his military draft imbroglio. Tens of thousands of Africans came out from their homes, shops, and places of work to see and hear the boxing heavyweight champion of the world. By a strange twist of fate, Ali just happened to notice Malcolm X, from a distance, walking in a city square in Ghana. He did not attempt to get Malcolm X’s attention for by this time, Ali and Malcolm X’s friendship was null and void. Ali had decided to follow the beliefs and tenets of Nation of Islam founder Elijah Muhammad rather than those of Malcolm X. As Ali was preparing to defend his heavyweight title against Liston in a 1965 rematch (which Ali would win by a knock out in the first round), Malcolm X was publicly predicting to CBS-TV’s Mike Wallace and other reporters that he, Malcolm X, would be assassinated due to his conflicts with Elijah Muhammad. In 1965 he was, and ever since Ali had feelings of remorse about his and Malcolm X’s failed friendship. After Malcolm X’s murder, five FBI agents were assigned to bodyguard Ali. Numerous polls taken during this time period of the mid-1960’s show that the majority of Americans supported the U.S. military activities in Vietnam but, ever so slowly, this was beginning to change. President Johnson announced that 17,500 more men would be drafted and additionally, he ordered another 50,000 more troops be assigned to Vietnam. In November, the Pentagon issued a directive in which any person who took a military induction test and had a recorded score of 15 could be eligible to be drafted. As Ali’s score was 16, this now meant that, by the unit of measurement of a sole point, he could now be drafted. Numerous prominent athletes of the 1960’s served in the military. The most notable was Roger Staubach, who won the 1963 Heisman Trophy after successfully quarterbacking the U.S. Naval Academy to a winning season. So Ali’s upcoming refusal to be drafted was something that U.S. citizens, of all creeds, races, and religions, were thinking about. This simple fact -- that a prominent athlete was by his conduct outside of his work place (in Ali’s case, a boxing ring) -- virtually forcing a country’s people to confront a major issue of enormous controversy -- was, and still is, quite rare. Ali was, in essence, defying the federal government and the military during a war.